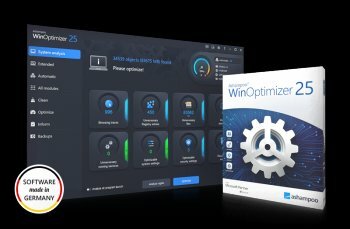 Ashampoo WinOptimizer 2019 boosts, cleans and optimizes the performance of your Windows system far beyond what built-in tools can deliver. Multiple included modules help analyze, customize and tweak Windows to your needs. One-click optimization, a user favorite, removes clutter, fixes invalid shortcuts and cleans your browsers off redundant data like browsing history entries and cookies. PC maintenance tools remove junk files and browsing traces and also clean the Registry database. Powerful process and service management tools along with boot optimization help improve Windows startup times. 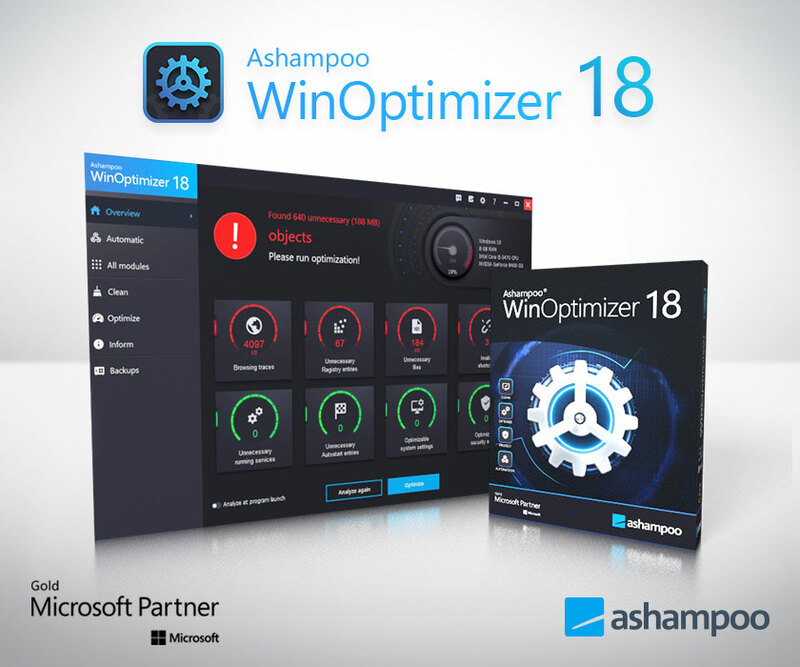 Ashampoo WinOptimizer 2019 also features powerful system analysis for detailed information on installed software and hardware. Effective privacy protection is achieved through two integrated modules. The first disables Windows telemetry features to prevent the system from phoning home while the second encrypts and password-protects your sensitive files. Other tools include HDD Benchmark to measure the read and write performance of your hard disks and Context Manager to fix invalid file associations. All cleaners have been updated to support all current software. As a first, Ashampoo WinOptimizer 2019 now includes an SSD wizard to improve the lifespan of your SSDs and the overall performance with Windows. - 1-Click optimization to clean and repair Windows systems - Safely delete web browsing traces, junk files and outdated Registry entries - Win10 Privacy Control for optimal privacy protection on Windows 10 systems - Custom Windows tweaks - Full control over startup programs and services - Extensive system and hardware analysis - Optimal SSD configuration - Run hard drive benchmarks - Manage and customize context menus. Not bad, many of the utilities are simply duplicated in Windows, the cleanup tool is surpassed big time by CCleaner - O&O ShutUp does a far better job of Windows 10 telemetry leaks & is again free. I don't even think it overwrites browser history which again CCleaner does. OK if you pay £7 or under $10 but pay no more - A few interesting modules in it but not many. Needs more thought to be put into it. Of all the cleanup utilities IMO Wise 365 is probably the best. It works ok. It will optimize and clean your PC. But to clean PC I prefer to use WinUtilities Pro. I'm not fond of this or any other fix all utility programs - 30 years ago with Win 95 maybe, but most internal Windows settings can be enabled by using 'GOD Mode' if you really feel the need, registry cleaners can cause more problems than they solve - Using a free program such as CCleaner is really all you need. What Nir cannot match with AWO, can be done via the Registry. I mentioned in another Ashampoo review about Site certificates. Free on the pirate bay. Only a fool would buy this scamware! Look at the fools below. Look like fanboyz. ROFL! Yeah your computer is faster noob! These losers make scamware and they LOL at the noobs that pay for it. Been using the program for a few years now, never ever had a problem with it, it does what it says it will do. I am pleased with it. Those who complain about it or call it names either have no idea what to do with it or do not need a computer. I have never had a install or uninstall problem with this software on windows 7 X64..
Preordered my key a week ago. Ashampoo products including this one are excellent. I have several I purchased from them and it certainly (as one mentioned here) is not scam ware. Anyone with any sense in their head can see that. They make good software and it all does as it says it will do. Some of you people who write reviews should get your facts straight or at the very least learn about software as some of the reviews in this place are lower than stupid. Ashampoo is a German company & the Germans never make anything less than excellent products. At the moment ALL Ashampoo software is available for £8.50 - Work that out in bucks yourself. 12 year birthday. mike59, you are a 100% cretin. It's a great piece of software, used it for ages, and 50$ is only if you don't use some of the great deals they have from time to time, I've got it for 10$, a good price imho. I use more of Ashampoos products, and I have never had a single problem. A quick glance at Mike59s profile, tells me he is a troll, sad some people don't have a life, I feel sorry for the guy.